The heat in Oklahoma appears to have broken. I’m glad this has happen as all the plants in my garden have stopped fruiting. No beans. No tomatoes. Now that we are back down into the high 90s, the tomatoes are starting to flower again. We even got a quarter inch of rain yesterday. 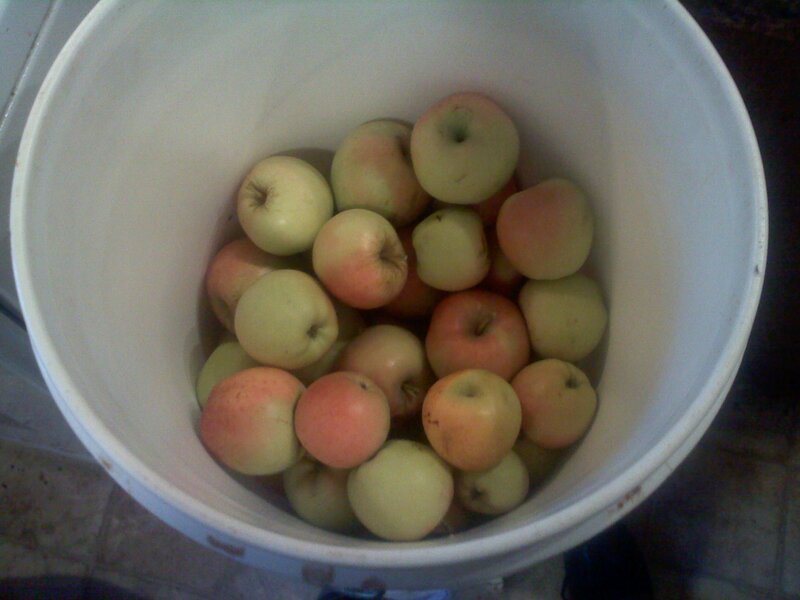 Half a bucket of apples. Like just about everything else that came with the house, don’t know variety. McIntosh, perhaps? Also, this week, the apples are ripening, which means harvest time and a scramble to preserve as much as I can for when the harvest is over. I’ve been a bit confused as to when the apples are ready, mainly because this is the first time I’ve dealt with apples that I’ve picked off a tree and partly because I don’t know what they are supposed to look like when they are ready to pick. I am already starting to preserve some of the apples by drying them into apple chips. I also intend to try making apple sauce and apple butter. I’m also saving the peals and cores to attempt extracting pectin so that I don’t have to buy pre-packaged pectin when making jellies. Wax moths quickly invaded the dead hive. Today, David came by to help tear down the dead hive. When I last checked the hive, I found zero brood, larva, and eggs, so it was only a matter of time before the hive was dead. 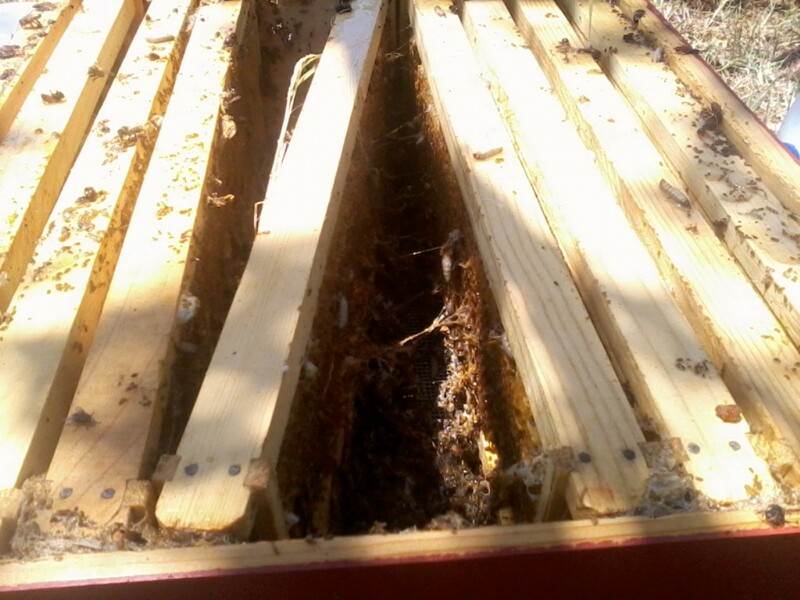 I sealed the hive up so that the other hives wouldn’t be able to rob the honey and contract European Foul Brood. Today we finally were able to pull the hive apart and start sterilizing the hive body parts for reuse. The first step of this was getting all the wax out of the frames. When we did this, we found lots of wax moth larva on the wax. After clearing off the wax, we sprayed everything down with a bleach solution to kill any bacteria on the parts. European Foul Brood is caused by a bacteria that eats the larva from the inside out and it is not something I want getting into my other hives. 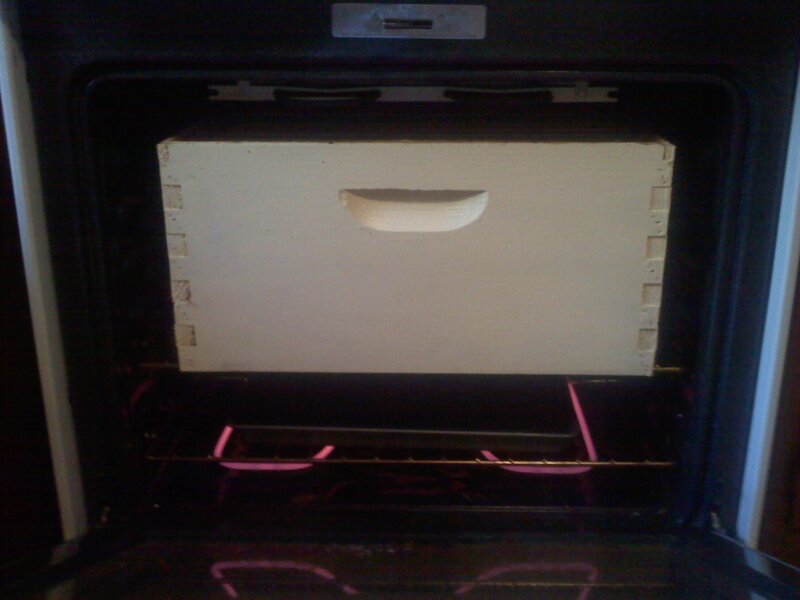 After that, we also put the parts into the oven for thirty minutes at 275°F (135°C) to kill off any bacteria that survived the bleach treatment and to further clean things up. I’m just finishing things up as I write this post. Looking in the top of the blue hive. 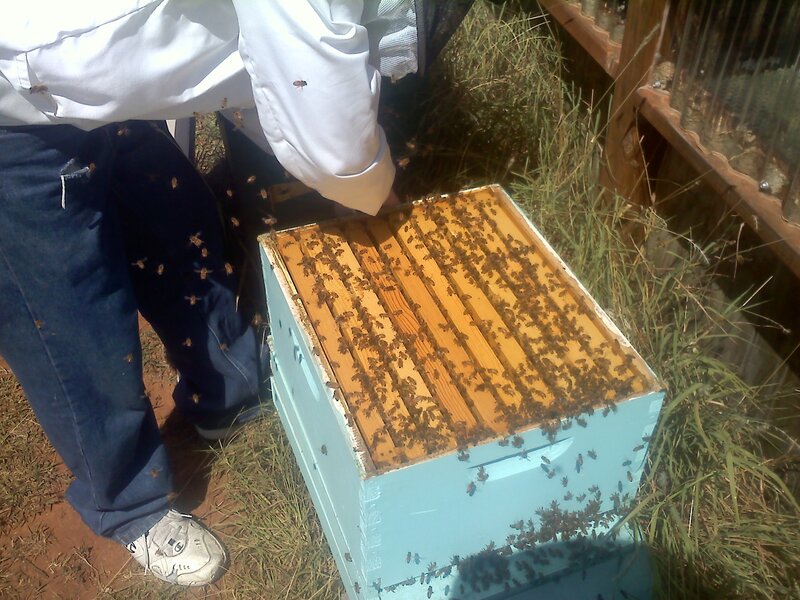 We also inspected the other hives to see how they were holding up to the drought and to check for any European Foul Brood. In all three other hives, we found a few dead larva, but at this point, we are not sure if it is EFB or starvation that is the primary cause. Unlike the hive that died, the remaining ones are doing alright. As a precaution, we are administering antibiotics to the three hives and putting on hive feeders either until winter or the drought breaks, whichever comes first. The surviving swarm was very aggressive today, causing myself to get stung four times today and David to get stung seven times. Because this is not the first time this hive has been aggressive, we are planning to requeen the hive in the spring with a more docile version.